We have been in our rented flat now for almost a year. I won't able to get a mortgage for a while now, so I'm going to keep adding to my living room inspiration board on Pinterest. Untill that day comes. Rental homes can be tricky, on one hand you want to make it feel like home whilst you're staying there. On the other hand you don't want to make it so homely that you will lose your deposit. When we moved into our new home I hated the fact that all the walls were white and we couldn't decorate them to my liking. 1.Use removeable wall arts, they are brilliant as they do not take the paint off the walls. 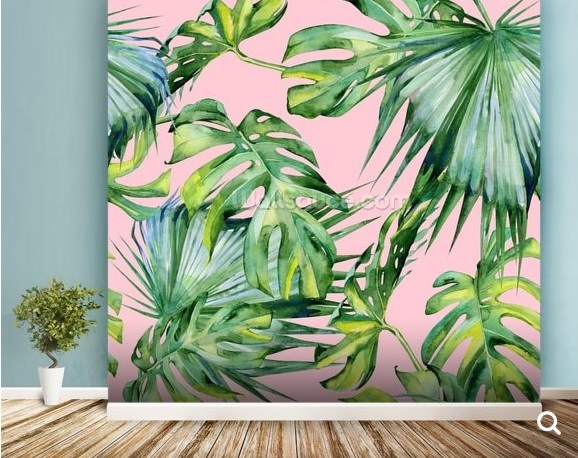 I have fallen in love with this stunning pink jungle wallpaper it would really add some much-needed colour and personality into our bathroom. Websites like wallsauce are great as who specialise in exciting and inspiring wall murals. They are easy to install and more importantly easy to removable when you fancy a change. 2. Invest in rugs, another thing most landlords will not allowed you to change is your flooring. A rug can hide a horrible flooring and add some home comfort. There's nothing better than watching the TV with a glass of rose, whilst your feet are getting all cosy in a fluffy rug. 3. Add plants, you can never have too many plants! Invest in some shade loving plants that will happily grown indoors. You don't have to be green fingered as they basically look after themselves. Just water them once a week and leave them to it. They not only look good, but some also help clean the air and remove toxins. 4. Place pictures of family and friends around the house. We live in a digital world and tend to keep our pictures on our phone or albums on Facebook. I always make an effort to print some of my favourite pictures and have them around the house as they bring back good memories. 5. Change your cabinet doors and handles, if you thinking of staying in your rental for a few years. Changing your cabinets doors and handles is a cheap way of updating your kitchen. Do you rent? How have you made changes to your rental to make it feel like a home?